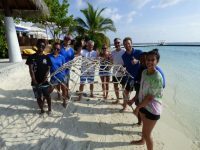 Since the beginning of tourism in Maldives during the 1970’s the local crafts have gained a vast popularity among tourists. 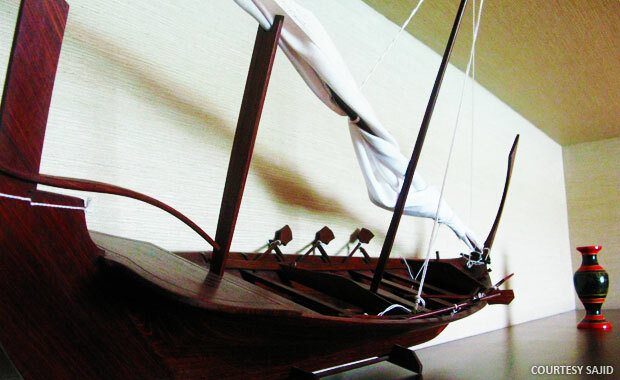 The various crafts and handiwork of Maldivian craftsmen have always intrigued travelers from all over the world. However over time the magnificent works of art has fallen victim to rising tides of cheap imitations and unauthentic replicates. While this may be due to the high production costs from traditional methods, when applied to large scale production, unauthentic products cannot even come close to the real ones in both beauty and uniqueness. Souvenir shops in the city and in islands usually trade both cheap imports and original local handicraft. For travelers it is vital to know that what they are paying for is authentic works of art. 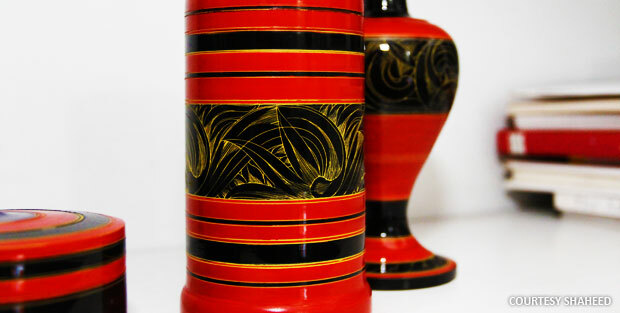 Also known as “Liye Laajehun”, Maldivian lacquer works are and always has been a magnificent art which has produced creative designs that have survived through the Maldivian history. 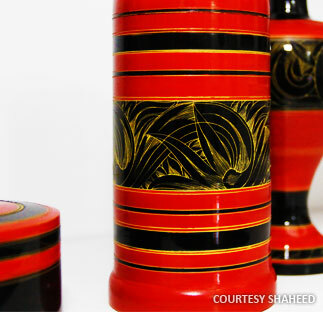 Since ancient times, the techniques have been applied to create vases, jewelry boxes, and kitchen utensils of fabulous beauty, for the royals of Maldives. It is a highly decorative art carried out by skilled artists in which lathes are used to paint layers of colored lac over shaped wood. Usually the artist starts with a bright color and ends with a dark color such as black. The artist then uses a sharp tipped object to carve designs exposing the bottom layers. A finishing polish is applied and the work is ready for use. 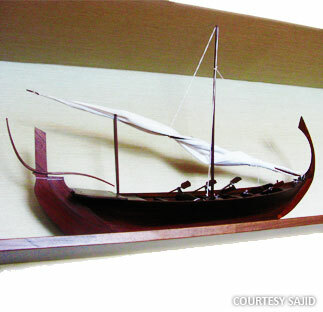 Dhonis or sail boats are a major invention of Maldivians as they were the first modes of transportation among Maldivians. 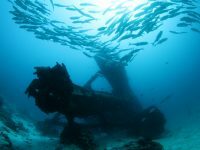 They are designed to withstand the vigor of the oceans and to provide swift motion. Crafting of miniature models of these ancient works of art is known as Dhoni crafting. 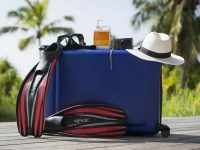 Such models of varying sizes and quality are available in Maldives. 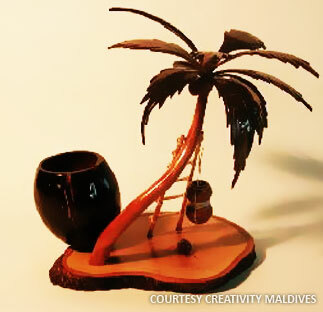 Maldivian artists use timber which is carved into models that represent the ancient vessels. The parts are polished and varnished before they are constructed into models. 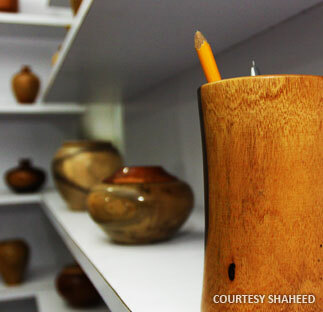 Due to the remoteness and abundance of plants in Maldives, ancient natives used wood from the trees to create objects to optimize their work and fulfill their needs. Objects such as kitchen utensils and containers were carved from wood. The carvings are sometimes polished and can represent magnificent designs. Wood carving has evolved to create works of art such as miniature models that represent the early Maldivians and their culture. These wood carvings are sometimes painted and sometimes subjected to lacquer work. Carvings of images and text into wood was also carried out by early Maldivians. Traditional Maldivian mosques have large wooden planks with text carved into them. Mats or “Kunaa” were vital to the early natives. They were mostly used for seating and sleeping among other uses. Mats have also been delivered as royal gifts by the Maldivian Sultans. 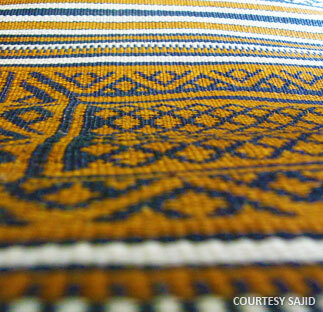 The artistic designs created during the weaving are still comparable to modern textures. However the technique used is very simple and mostly it is just the creativity of the weaver that produces astonishing designs. Screw-pine leaves are collected and dried in the sun. Natural dyes are then used to dye them into three basic colors, black, brown and yellow. A simple loom and a knife are used to slit screw-pine leaves to produce the varying patterns on the mat. Coconut is one of the most abundant fruits in Maldives. It is one of those fruits that can be used during all stages of its maturation. 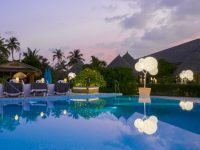 In fact the coconut palm, one of the most abundant palm trees in Maldives, is the Maldivian national tree and has been used for multiple purposes throughout history. The trunks are used for timber while the husks are used to make coir ropes.The leaves are used for weaving mats and creating thatching for roofs. The eakles are used to create brooms. The shell is cleaned, dried, and polished, before it is used to create ornaments or other works of art. “Raa Bandhi” is a container created from two coconut shells joined to increase capacity. It is used to collect and store toddy from coconut palms. 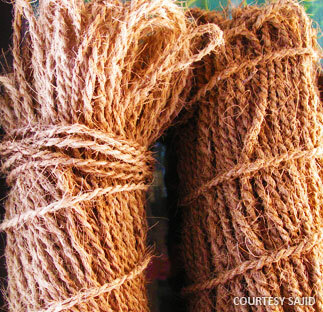 Coir Ropes are an important part of Maldivian civilization, as they have multiple purposes. 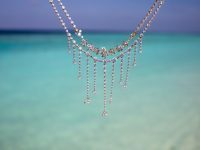 They were extremely important to early Maldivians during the building of huts and construction of sailing vessels and hammocks. 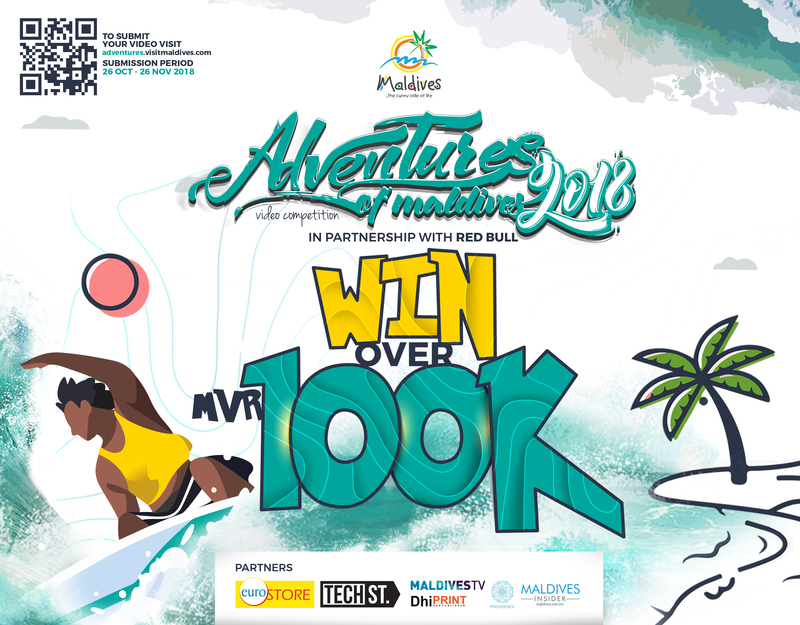 Ancient Maldivians chose the coconut husks as it is a strong material as well as an easily available resource. The coconut husks are soaked for about two or three weeks by burying them in the beach. They are then pounded and beaten into fibers which are washed and sun dried. They are then hand rolled and woven into ropes of different sizes. The coir ropes or “Roanu” are now mainly used in ornamental purposes.